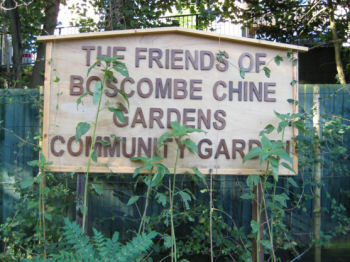 The community garden was originally championed by the Friends of Boscombe Chine Gardens (FoBCG’s) first chairman (Chris Wakefield). 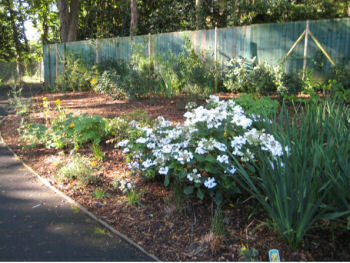 As work started to refurbish Boscombe Chine Gardens in 2005, his thoughts for a community garden evolved. Through talks with members of the FoBCG’s and people using the Gardens a common objective was identified. 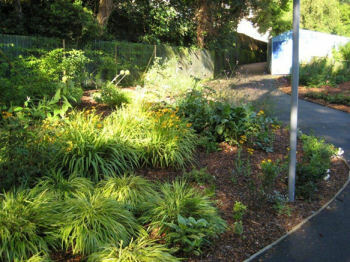 Following discussion with Bournemouth Council the present area was set aside for the community garden. It had been a neglected corner of the garden with overhanging trees and was fronted by four pathways and contained a few overgrown shrubs. 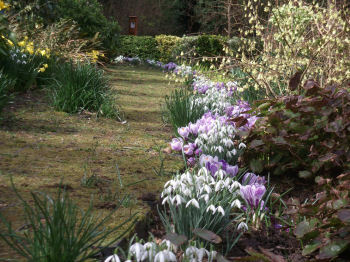 A committee member (Jane Kelly) who was a keen gardener took up the challenge to design the garden layout and planting format. 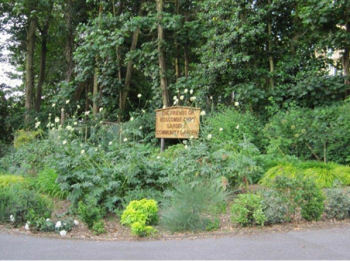 With help and assistance from some of the Council’s gardeners at the King's Park Nursery the community garden began to become a reality. 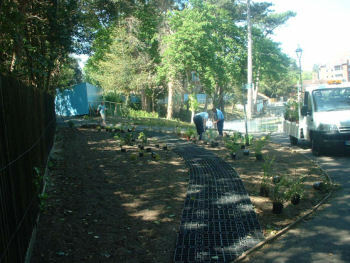 The community garden was designed to be enjoyed by all the community and includes an all weather track across the centre which is suitable for wheelchair access. In 2008 further fundraising followed by collaboration with SHARP (Self-Help Action Recovery Programme) a local rehabilitation charity produced our community garden sign. Initially the sign looked enormous amid the slowly growing plants but is now just visible amongst the present lush foliage. 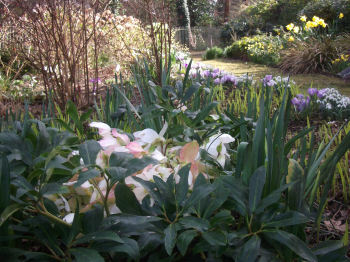 The planting originally followed a yellow and white theme using evergreen and deciduous, hardy perennial plants, shrubs and climbers, with the aim to have different plants in bloom at all times throughout the year thus providing continuous colour. This has been mainly successful with the occasional rogue purple foxglove creeping in. Very gradually the plants bedded in and started to grow, tended by the FoBCG’s and supplemented by the addition of more plants and lots of bulbs, often donated by members. As the years have passed various problems have arisen and been solved. 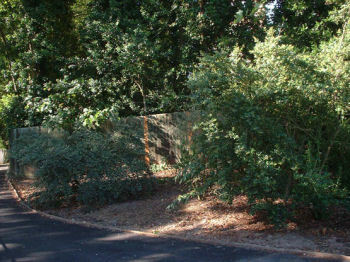 These have included cultivating a low hedge around the front of the garden to deter the trampling of plants by wandering animals. Also, the repetitive and back aching removal of sycamore seedlings from the overhanging trees to the rear of the community garden. Fundraising and further assistance from the Council enabled the installation of an irrigation system, which was required because the overhanging sycamore trees also shielded the plot from the rain. Prior to installing the irrigation system water was carried from the nearest source located across the park in the Education Centre. Over the years the community garden has continued to develop and given hours of pleasure to those who attend to its needs and those who just walk by. 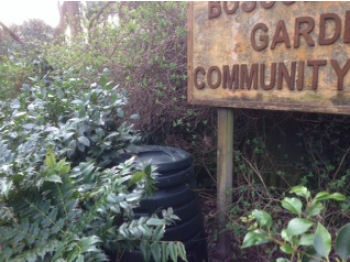 In 2013 the FoBCG’s entered the community garden in Britain in Bloom’s popular It's Your Neighbourhood competition and gained a level 5 award, which is the highest level. This year we have added two discreetly placed compost bins, which will allow on-site recycling and eventual soil improvement (previously we gave our waste to the Council’s gardening team for recycling). The community garden continues to flourish with support and care from members of the FoBCG’s and we are very grateful for any time that volunteers generously donate towards the general upkeep of this corner of the park. If you like to potter in the garden and perhaps now live in a flat and miss this experience, why not contact the FoBCG’s and lend a helping hand? 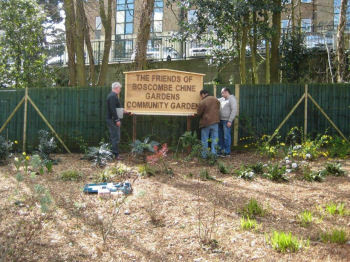 In addition to the community garden, FoBCG’s volunteers are involved in a number of different areas within Boscombe Chine Gardens including; bird box maintenance, bat box surveys (under the watchful eye of the Dorset bat Group), garden related talks and various events throughout the year.